As artists, most of us are thinkers--as well as doers. I love to write and have been involved in creative writing and poetry since my youth. As an adult, I have continued to write creatively..., but often I do not have the time or energy to put pen to paper--or in this case: fingers to keyboard. My art takes all of my time beyond the necessary activities of my life and job. Consequently, although my mind continues to work overtime, I seldom record my thoughts...letting them merely fly through my consciousness and be gone. Some thoughts (prophetic or otherwise) are scribbled in my many sketchbooks, but most could not be deciphered--much less formed into meaningful prose. I would like to change that with this blog--using it as a way to document my thinking as I move forward in my artistic evolution. I hope you enjoy reading this and future posts. My goal is to post at least once a month. Although I cannot promise great poetry or prophetic writings, I do promise to be authentic. My intent is for these posts to be "non-denominational" and global. This blog is about ideas and art and artistic--creative--expression. Posts will focus on art, life, thoughts, ideas, feelings, and the search for understanding and fulfillment. I invite you to read and comment. I hope you are sometimes touched and always challenged in a good way. Who or what inspires your creation and/or creative energy? Do you have a muse? I recently gave this a lot of thought, and my answer to the above question follows. Vincent Van Gogh changed my life when he almost got me kicked out of D.C. museum. I admit it was really my fault… It was love-at-first-sight. Needless to say, I was followed from room to room by museum guards after that! The next meaningful encounter was one summer in the late 1980’s when I spent 6 weeks in a French Impressionist Art class during which I wrote a research paper on “The Psychocritique of Van Gogh’s Self Portraits.” That summer and all the research and time I spent ‘with Van Gogh,’ intensified and solidified my relationship. By the end of that summer, I had written several poems about Van Gogh, as well as the paper. During those weeks, I closely studied over 20 of his self-portraits, pairing that scrutiny with much research into the man and his French writings. The most revealing source of the man-artist himself was the book of his many letters to his brother, Theo. Beautiful, intimate letters of feelings, observations, life experiences, relationships, and deep thoughts—a treasure trove of insights. I still have that book and cherish it. 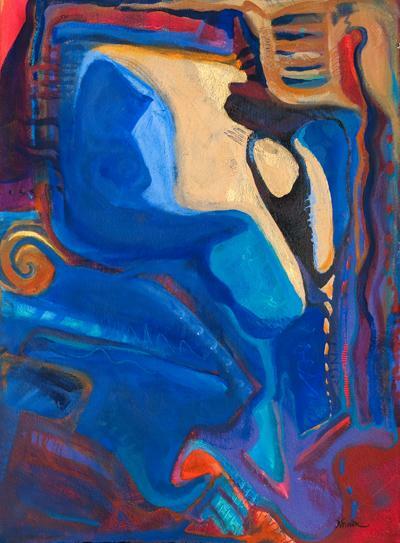 From my art roots in 2 dimensions (pencil/pen drawings) to sculpture and 3-dimensional works in college, my art journey continued its evolution through the 80’s, 90’s, leading me from oil painting and realism (1980’s) to watercolor and expressionism (1990’s). For some 15 years, color and shape were my focus (1993-2008). All the while, I sought to capture and convey more ideas and feeling in my work, just as Vincent had done. Watercolor enabled me to put more of myself into my work thanks to the gestural freedom and spontaneity it allows. For the last several years, I have been spending weeks or months on a single work, creating non-objective paintings using acrylics and mixed media on canvas or paper—a seemingly natural convergence of my 2- and 3-D roots. All of these experiences have contributed to breakthroughs in my art and influenced my content and approach. In recent years, I have worked on several series exploring thoughts, feelings, and dreams…with a special focus on the subconscious and the unconscious. I often have insomnia, so am trying to leverage those long nights and capture the many thoughts, images, words, and feelings that mesh into one…visions sometimes swirling just out of reach. A sketchbook sits on my bed-side table, and many nights I capture dream thoughts or fragments of the stream of disjointed musings that populate my semi-consciousness so that I can later try to put them into my writings or paintings. To try and convey some of this complex weaving or layering of thoughts and images, my latest paintings frequently incorporate texture, found objects, or words. Each work has an underlying idea or story, and the intent is solid in my mind as I begin painting. Much thought takes place before and during the creative process. I owe it to myself to be thoughtful in my creation…and I feel I owe that much to those who view my art, also. Even as I sometimes let the creative wave take me from thought to intuition and feeling, I have the choice of when to consciously step in and control an outcome. All of me is involved in the creative process—mind, body, and spirit; both the conscious and the unconscious. This 20-year comprehensive body of work is my self portrait – a work in progress as I am. It is also a small tribute to Vincent Van Gogh. 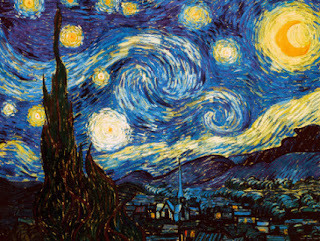 Other painters and other works inspire me..., but Van Gogh will always be my first love. He continues to inspire and touch my work. Hello Elaine, As a teenager, I made my first foray to the Chicago Art Institute where I saw Van Gogh's paintings. Having always felt a kinship with him, understanding his torment- I too was mesmerized by his work. Being naive about museums and being totally transfixed by his paintings in "real life" I reached over the red velvet rope and put my finger in the brush stroke of "Bedroom at Arles" !!! My finger fit in the deep paint on the foot of the bed. No one saw me !!! My head was spinning. I don't know how long I stood motionless in front of that painting. Somehow, I managed to move away from that painting and rounded a corner and ran face to face- eye to eye with his portrait with the bandage over his ear. Now I was really spinning. Our eyes locked. I knew him. And he saw me !! Vincent was always the one I chose to study. I felt him. I would see the very images he painted- the naked knarled fruit trees, the fields, the wind whipping up the sky. Then in my 40's I went to France, to Arles, the Camargue. And I saw exactly what he was saying. The wind in the Camargue is agitated and does not blow in a straight line. It twists and turns. The trees twist and turn. As does the sky. Vincent painted a movie- not a static painting. It moved. As I walked along the river in Arles, I saw the lights and the stars just as he painted them. I wept. My brother, Vincent. Even today, years later, Vincent is a soul mate- something I never knew anyone else shared. Thank you for sharing you kinship.